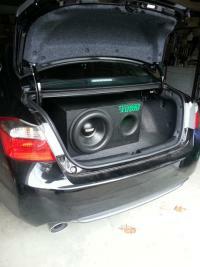 Car audio, car performance, electrical stuff, music, DIY projects. X15 box, SQL killer lows, hows my design look? Okay, I'll see what others say and then choose. I'm not in a rush to build the box cause I have to get some other stuff to the car done. I appreciate the input! I see.. I'm on stock battery lol.. Going to be getting a D1200 up front and a xp2000 in back when I actually start redoing my setup. I plan on sealing off eventually. And I'm trying to get louder on lows rather.. It plays 40-50 fairly loud, well loud enough for me at least. I'll be shooting for a GOOD amount of port area too. I'm going to eventually get a 80PRS and fit it in my pocket under the factory radio, so that would help everything sound much cleaner too. Thanks for the input man! And my bad for not specifying the car. Its going into the trunk of my 2013 Accord Sedan Sport!I got 30"~ of depth and 29" width and 17.5" height. I don't need a box design but I'm trying to figure out what's a good NET volume for this sub. It takes my CT 1400.1 easily too.. I'd also like to have killer lows too. The E12v1 is a great sub for the most money! Ive built a box for my buddy for one of them on 500rms and it sounds awesome. You can't go wrong with the E's. You get more cone area with 2 10s too, so I would just go buy the 10s and build a nice ported box and you'll be surprised. Hey Jocob, I have X-15, interesting in doing a 6th order? Would this sub work well in one? Suggestions would be great! If you could pm that would be awesome, thanks! how much power can sundown x15 really take? I have my X15 on a CT Sounds AT1400.1 but the box is only 3.4ft^3 net, tuned to 28hz via 6" areo, a lil short on port area.. I drop to 12v until I get my new batts but im sure it could take 2 of them strapped. Either more power or a bigger box around 4ft^3 should be good Oh and the sub barely moves.. maybe moves and inch lol.. its got so much more potential. So I measured my trunk again, and because the rear deck comes down near the seat more, the box will have to be behind that (unless sub faces up inside the box, ported on bottom and top) but my dimmensions are 17.75"H x 30.5"W x 30"D. I came up with a design that works (but dont know if its actually good). Chamber 1 is 3.7ft^3 tuned to 28hz. (15.37^2 inches per foot) Chamber 2 is 1.39ft^3 tuned to 74hz. (58.45^2 inches per foot) This is with the low pass set at 80hz and forgot to add the SSF. The sub will be facing one side of the box and ported on each side firing into the cabin, sealed off from the trunk. I'm not too keen on sealed boxes. I like to have a killer low end 4 orders and sealed boxes are 2 completely different things. I realize that, but one chamber of a fourth is sealed. I would prefer a low tuned box rather than a fourth but I want to try something different so I figured a 6th.